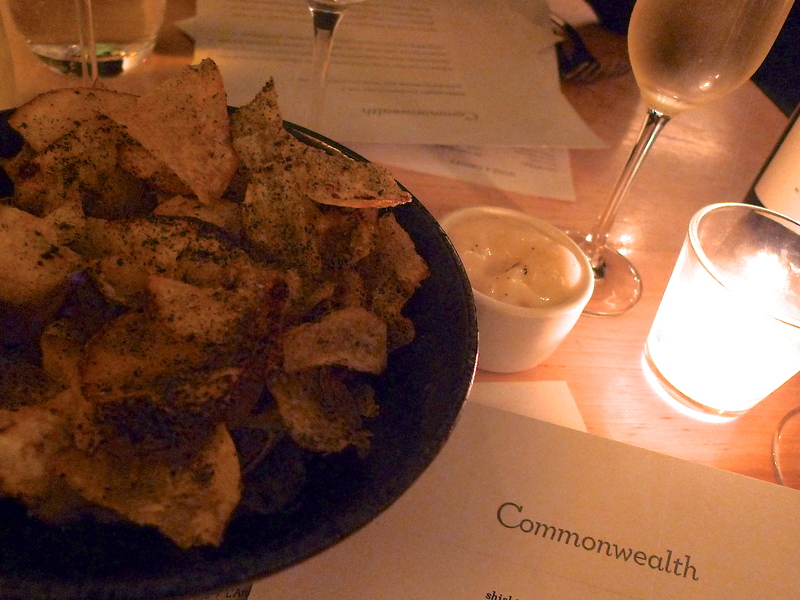 Commonwealth defines the act of harmonious food. Darling bf took me here for my birthday meal…yes, another one. Bear with me, it’s been an ongoing celebration this month, lucky me! As I was saying, each dish should not be judged on its individual components. Each component could certainly stand on their own, but here they seemed to only shine when they are eaten all together. Hence, “harmony in layers”. Kombu dusted malt vinegar potato chips with aïoli. 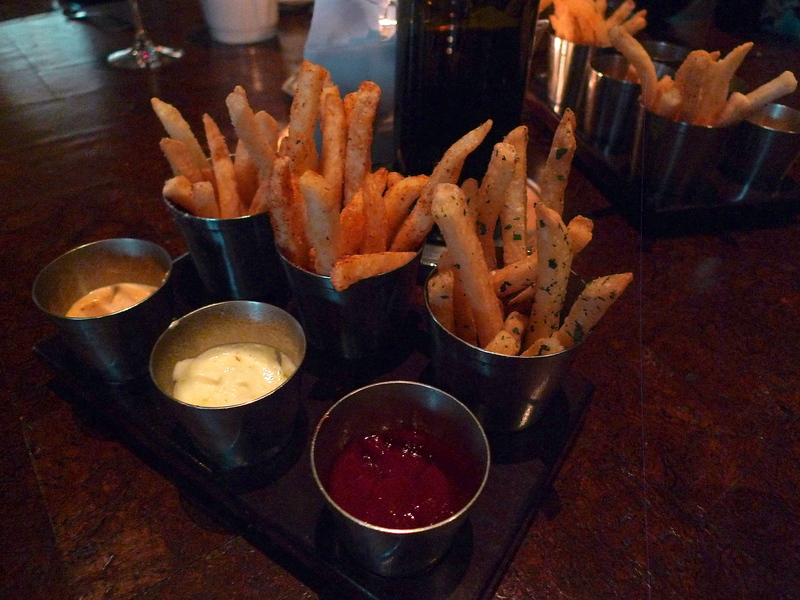 We started out our gastronomic feast with complimentary bubbly and nibbles. You know you’re in trouble when chips are a pre-meal snack because who can stop with having just a few? 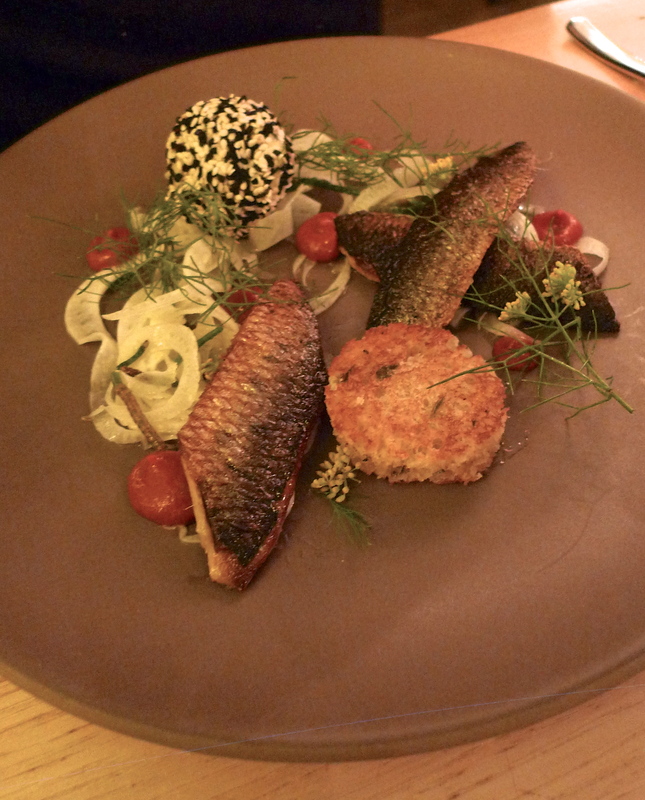 Smoked sardines with avocado ice cream, fennel, seaweed brioche, sesame and berry kimchee. To me, this is the course that most defines the concept of Commonwealth. Every bite was so incredibly different depending on how you combined the ingredients. For example, when you built a bite containing all of the components, this dish really made sense. It was so deliciously unique. 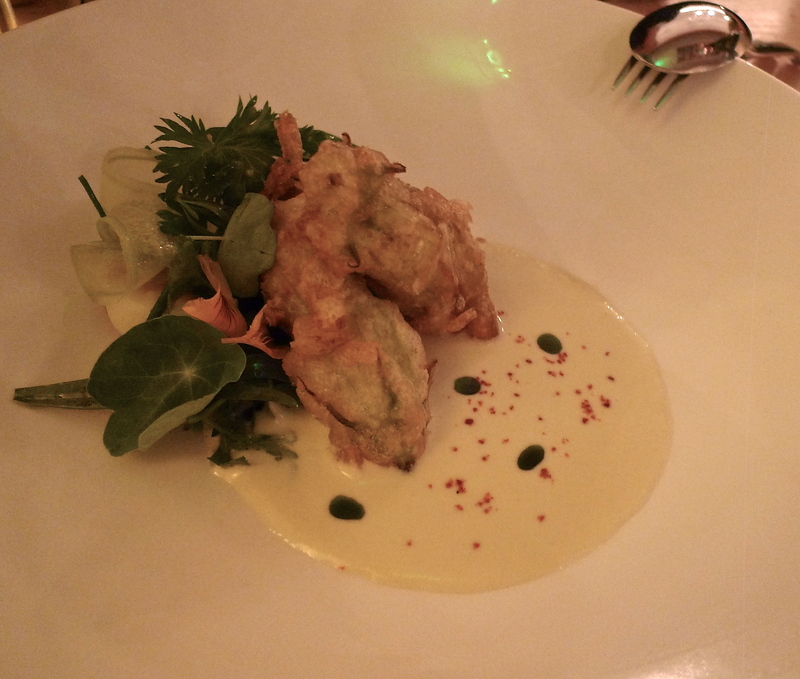 Brandade stuffed squash blossoms with chilled artichoke cream, celery and soft boiled egg. Remember when I made a comment that I really liked fried squash blossoms without any filling on my post from Park Tavern? Well, in this case, bring on the filling…if it’s brandade! They seasoned this brandade (basically a salt cod/potato/olive oil emulsion) perfectly as it did not overwhelm the flavor of the squash blossom. Squid on the plancha with watermelon, padrón pepper, cashew, black garlic and rice cracker. 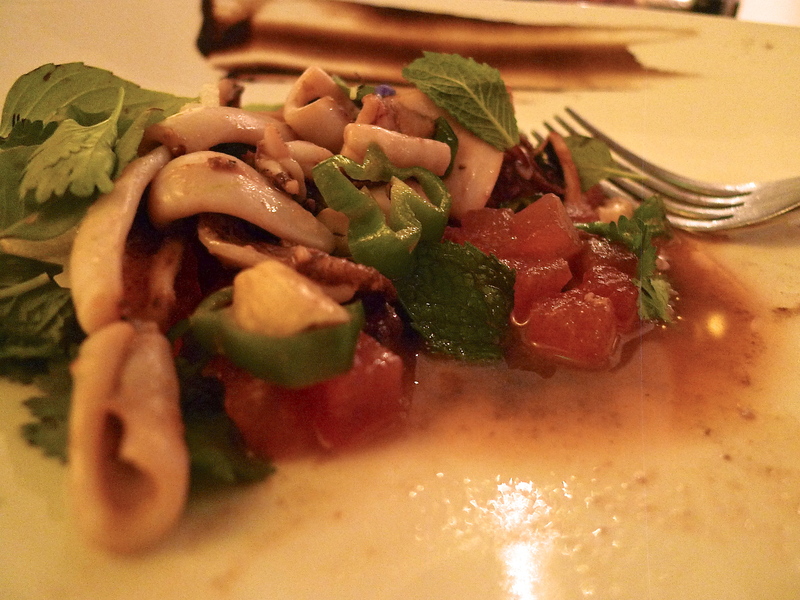 I was doubtful of eating warm watermelon, but the savory & sweet combination worked with the superbly fresh squid along with a little heat from the pepper. 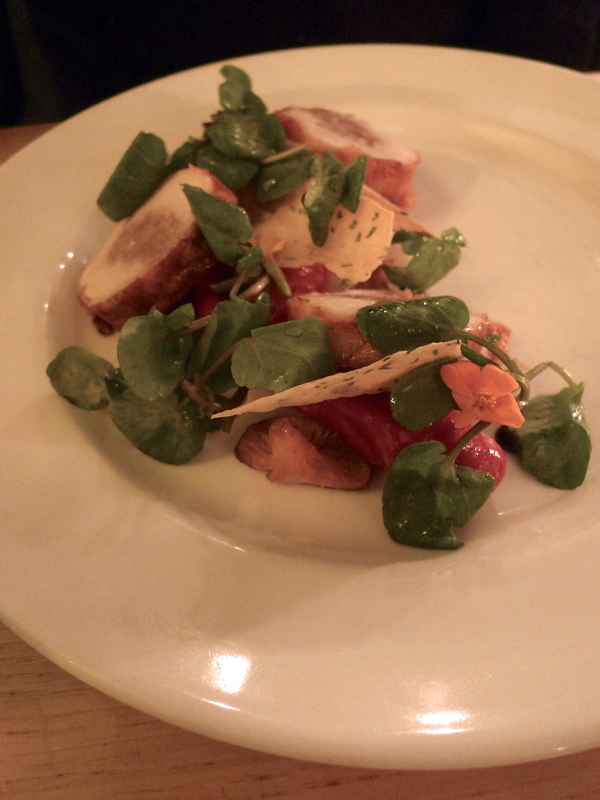 Young hen with nardello peppers, chanterelles, escalavida, parsley and garlic cracker. This was bf’s main course and it was very good. Can you tell I’m getting full? Darn those potato chips! 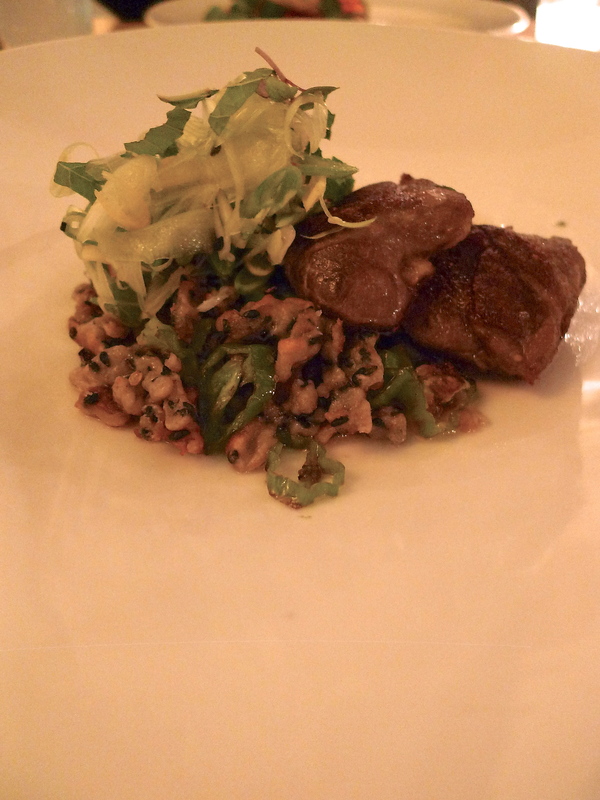 Grilled lamb cheeks with shishito peppers, sesame spaetzle, raw bean salad and tomato dashi. I was hitting my limit this evening and from this point forward my forkfuls were getting smaller…slower…though the appreciation was still very high! This was a wonder in many textures and flavors. Again, eaten all together it was really a fantastic and creative entrée. Grape sorbet with almond granita and poppyseed meringue. Just when I thought I could not ingest one more bite, they brought out this exquisite palate cleansing course and, trust me, I fought for my share! 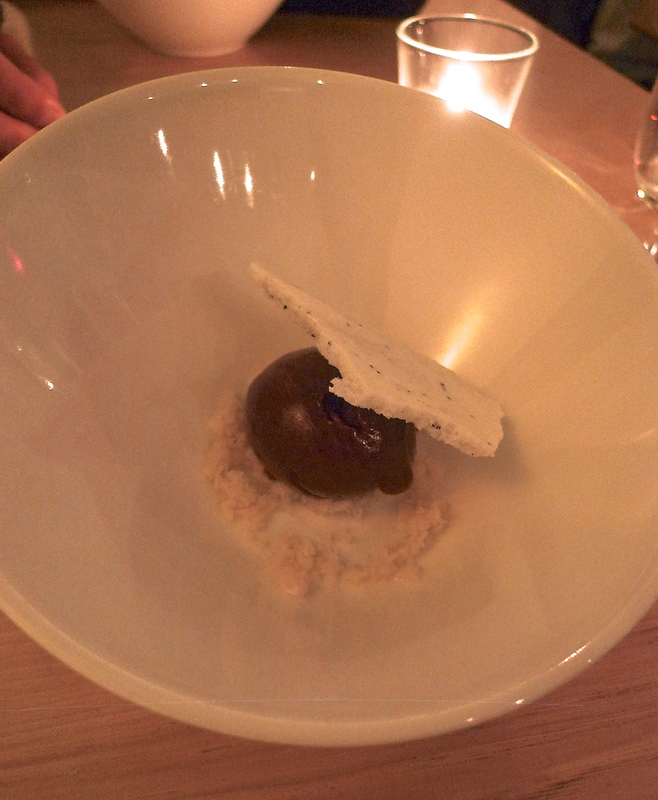 Wow, this grape sorbet packed such a punch of flavor. Amazing. Refreshing. 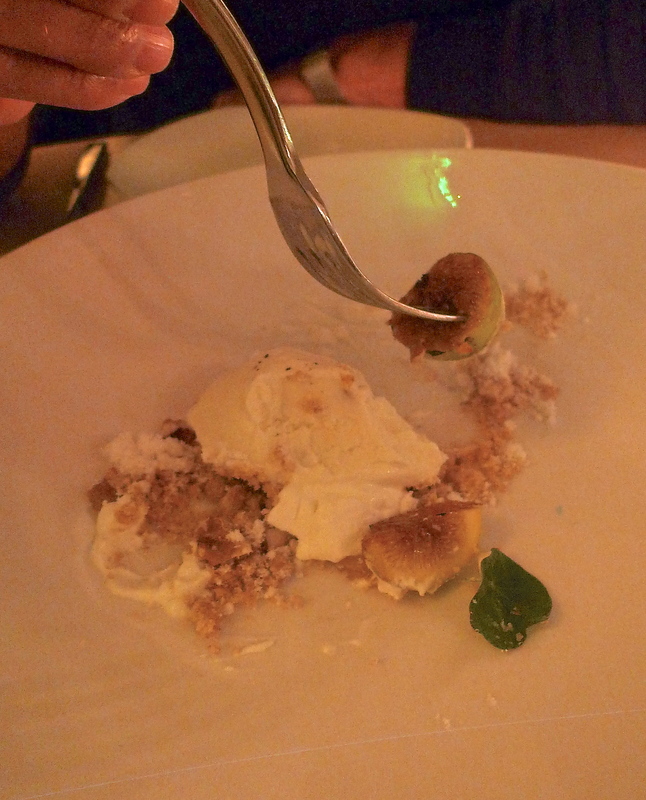 Bruléed figs, fig leaf ice cream, walnut streusel, lemon crème fraîche. How unfair. Back-to-back delectable desserts after a very filling meal. No worries, I managed to find more room in the ‘ol tummy. I love me some disco ball so I had to share this tiny peek into the dining room/kitchen. We had a very pretty meal here at Commonwealth. The restaurant is unimposing in its decor and service, yet they deliver creative, delicious, haute cuisine that everyone can enjoy. It was a memorable meal. Posted by aconsciousappetite in Food, Have A Sweet Tooth?, Restaurants, Where's The Beef? Michael Mina is now a conglomerate in the restaurant industry. In the San Francisco/Bay Area alone he has 5 World-Class restaurants, including Michelin rated “Michael Mina”. 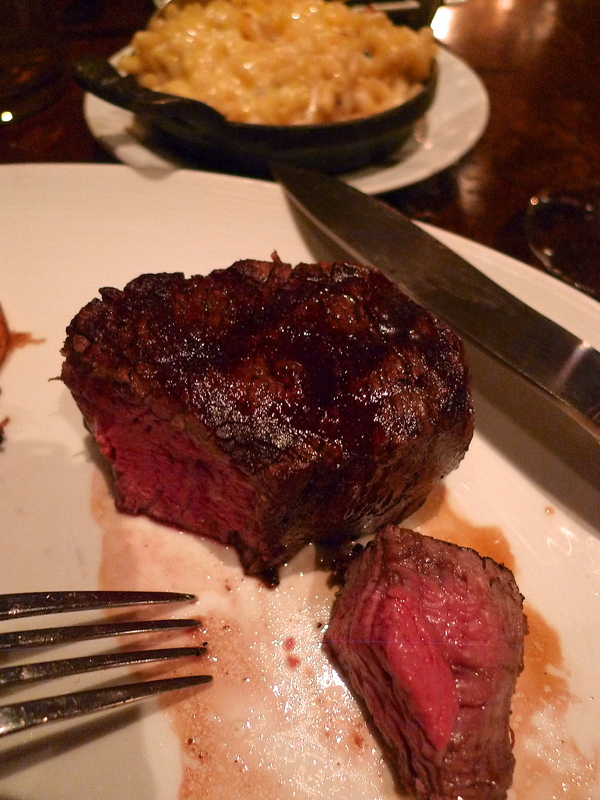 On this evening, my indulgent parents treated me to a carnivores delight at Michael’s, Bourbon Steak. Trio of Bourbon Steak French Fries. Herb-sprinkled, harissa-scented, and cheddar-dusted with sauces of spicy ketchup, house-made aïoli, and creamy bbq. When the house sends out complimentary starters, they somehow taste extra good, or am I alone in this sentiment? But, in this case, these fried wonders need no aid because they are the best french fries in SF. Perhaps because they are fried in DUCK FAT. Game over, right? With all of the different sauces and flavors, your combinations are vast, but I stick to their respectable pairings because it just plain works. 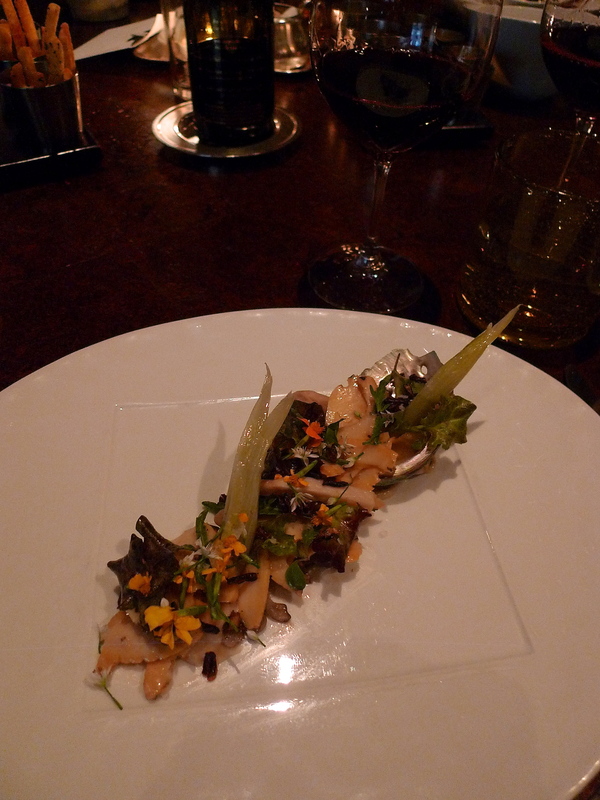 Monterey Bay Abalone with roasted garlic, pickled foraged mushrooms, confit fennel and golden balsamic. 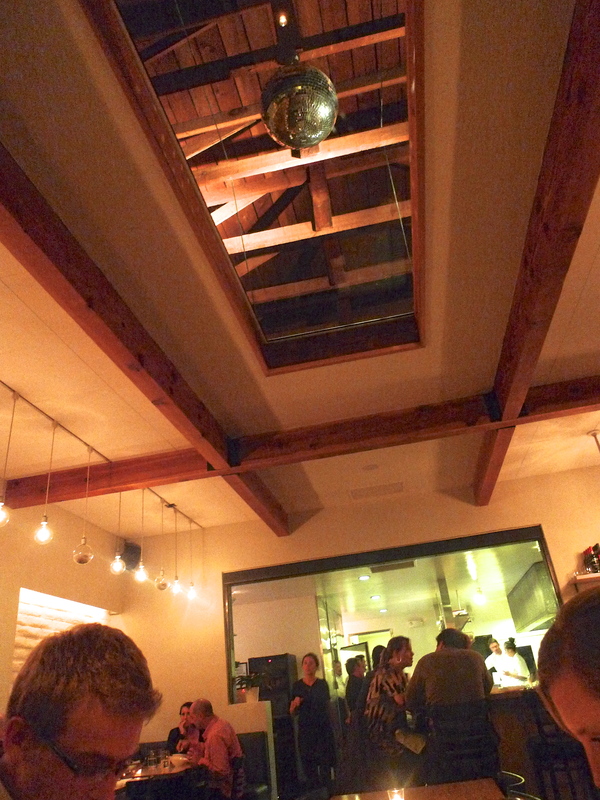 What you see above is one of the reasons I chose to dine here for this special occasion. For some reason, Abalone is not found readily in bay area restaurants and, boy, do I love abalone! This appetizer was divine. Light, flavorful, and riddled with different textures. Such a delightful dish, made me smile eating it. 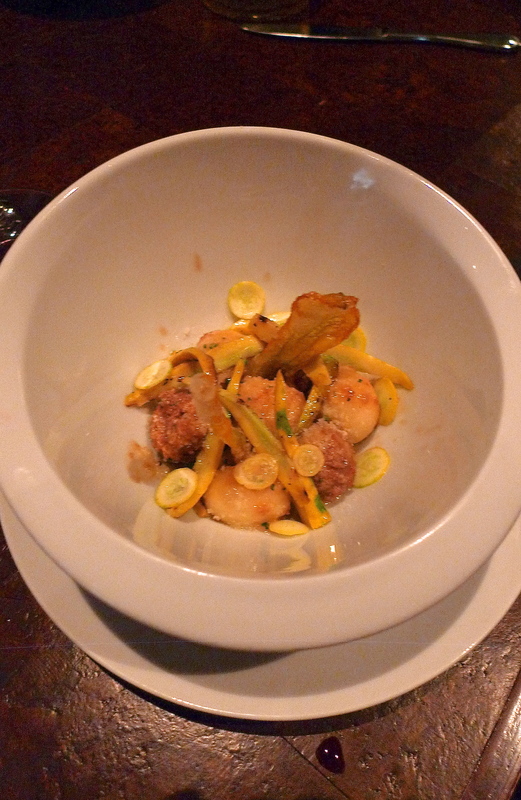 Fresh Ricotta Gnudi with duck meatballs, squash blossom and parmigiano-reggiano. First of all, gnudi is pronounced “nu-dee”. Heh. Gnudi is a type of gnocchi made from ricotta cheese and a little flour…as you can image this was light and fluffy. It is perfectly coupled with the stronger texture and flavor of the duck meatballs. Beef shouldn’t taste this good and this is why I could never be a vegetarian. I’ve cut back on my beef intake, but every once in a while, this is what I dream about and crave. Filet nirvana. Creamy Black Truffle Mac & Cheese. Oh YEAH, I went there. Full octane, no holds barred, calorie and fat allotment for an entire week, all in one darling Staub ramekin. 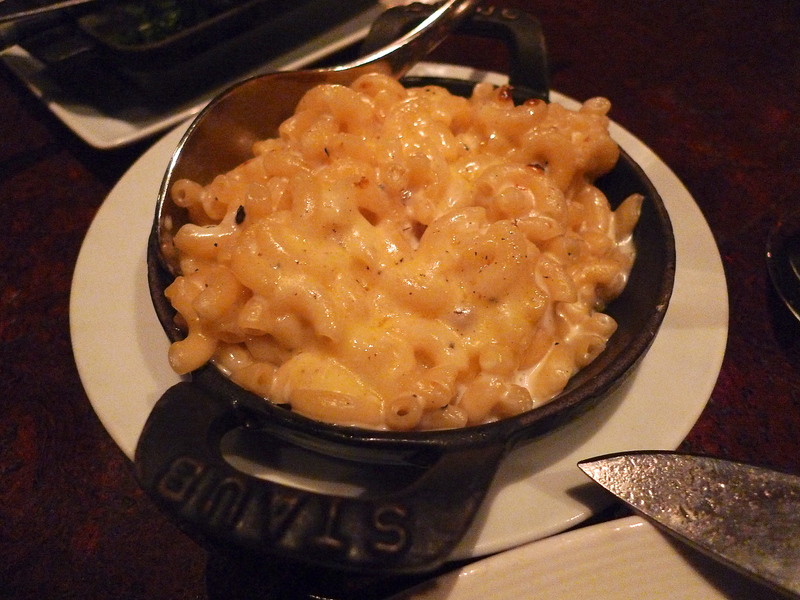 I can’t say much about this other than Michael Mina’s mac & cheese is the benchmark. 18 oz. 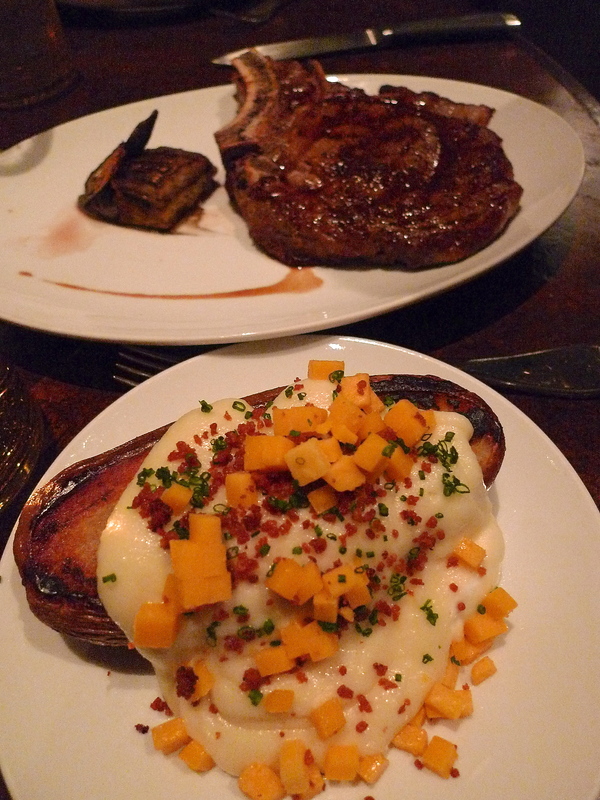 Angus Bone-in Ribeye with the side, Salt-Baked Potato “Loaded”. Loaded? It’s more like an avalanche! Another caloric wonder and, honestly, toppings aside, the most flavorful potato I’ve tasted. In the background, is darling bf’s conservative-sized 18 oz. steak. May I add that he ate it down to the bone? Sorry honey, had to share that. 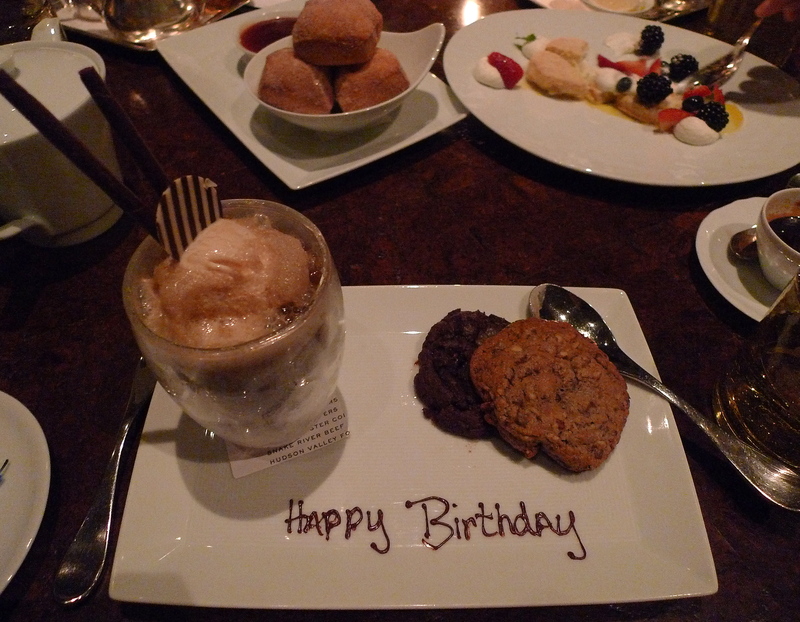 Michael Mina’s Signature Root Beer Float – Sassafras, root beer and chocolate chip cookies. Beignets with cinnamon sugar and Macallan caramel custard. Berry Short Cake with mixed berries, lemon crème, lavender chantilly. Yes, this was my birthday celebration with my dear family. How fortunate that I was able to celebrate it together with them this year. Thank you to my parents for a wonderful evening of fantastic cuisine and fun, loving company!